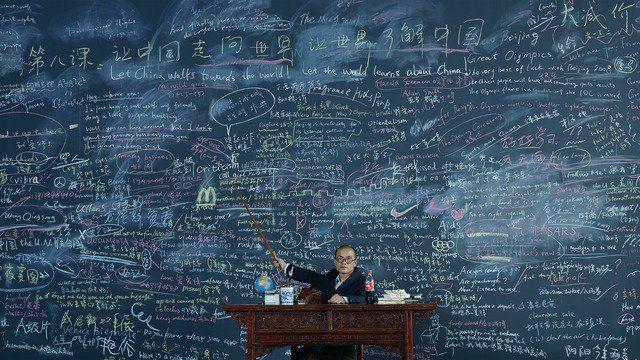 Chinese artist Wang Qingsong was born at the start of China's Cultural Revolution, in 1966. At age thirteen he began working in Hubei province's oil fields, Central China, in order to support his family after his father's sudden death. He worked as a labourer for eight years before getting accepted at the prestigious painting department of Sichuan's Fine Arts Academy, from which he graduated in painting and moved to Beijing in 1993. Shocked and fascinated simultaneously by China's rapid economic and social changes at the time - especially visible in Beijing - Wang Qingsong began documenting the city and its inhabitants in the process of opening up to a market economy and consumerism. The artist quickly made photography his medium of choice, even though his training in painting and hence composition are apparent in all of his works. However, Wang is known to have referred to his own work as a type of journalism, where exaggeration and focus highlight a truth. 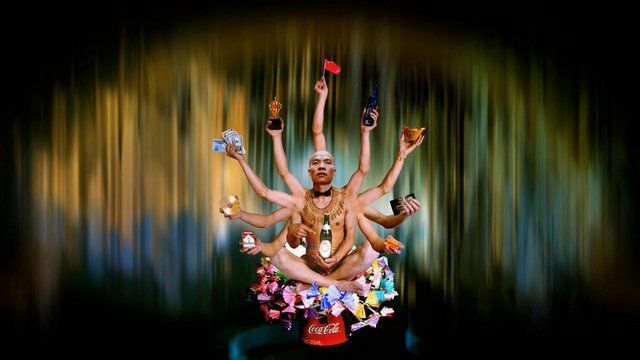 Wang Qingsong references ancient Chinese Culture as much as modern contexts and global Western icons: he creates a new cultural territory. The latter is a product out of contrasting and contradicting traditional China, modern China, and Western cultural influences dominant in China today. The artist has had numerous international solo exhibitions, including Wang Qingsong, Gallery 100, Taipei, Taiwan, 2012; The History of Monuments, Taipei MOCA plaza, Taiwan, 2011; When The World Collides, International Centre of Photography, New York, 2011; Happy New Year, Tang Contemporary, Beijing; Glorious Life - Wang Qingsong Photo Works 1997-2010, Lucca Photo Festival, Villa Bottini, Lucca, Italy, 2010; Wang Qingsong, 2009, Hammer Museum, LA, 2008. His work is also held in several prestigious private and public collections around the world. To mention a few: Asia Society, New York; San Francisco Museum of Art; Victoria & Albert Museum, London; J. Paul Getty Museum; Mori Art Museum; National Art Museum of Brazil. Sao Paulo; JGS Foundation, New York. The artist exhibited at both the 55th Venice Biennale, Venice, Italy, 2013; and the Istanbul Biennale, Istanbul, Turkey, 2013. Wang Qingsong lives and works in Beijing.